If you are happy and you know it, you are among the few in America according to a recent report. The release of the 7th World Happiness Report, saw the U.S. drop for the third year in a row in world rankings of happiest country on earth from 14th place in 2017 to 18th place in 2018 to its worst ranking ever of 19th place in 2019. 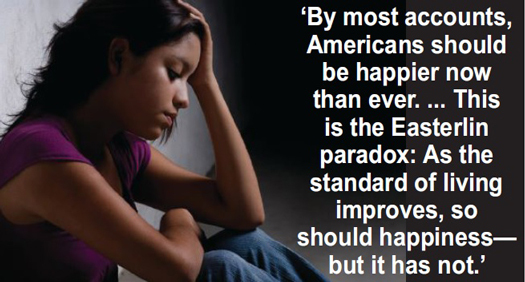 Why are Americans so unhappy? Professor Jeffrey Sachs, director of the Sustainable Development Solutions Network, focused on the epidemic of addiction and unhappiness in America, in his chapter in the report. “This year’s report provides sobering evidence of how addictions are causing considerable unhappiness and depression in the U.S.,” Dr. Sachs said. “Addictions come in many forms, from substance abuse to gambling to digital media. The compulsive pursuit of substance abuse and addictive behaviors is causing severe unhappiness. Government, business, and communities should use these indicators to set new policies aimed at overcoming these sources of unhappiness,” he added. “The World Happiness Report, together with the Global Happiness and Policy Report offer the world’s governments and individuals the opportunity to rethink public policies as well as individual life choices, to raise happiness and well being. We are in an era of rising tensions and negative emotions and these findings point to underlying challenges that need to be addressed,” Prof. Sachs points out. The World Happiness Report 2019 ranks 156 countries by how happy their citizens perceive themselves to be, according to their evaluations of their own lives. It was released at the United Nations and produced in partnership with The Ernesto Illy Foundation. “We are living a moment of transition to a new age and this generates a sense of uncertainty,” said Andrea Illy, Chairman of illycaffè and board member of Fondazione Ernesto Illy. This year’s happiness report released March 20 focuses on happiness and the community: how happiness has evolved over the past dozen years, with a focus on the technologies, social norms, conflicts and government policies that have driven those changes. Special chapters focus on generosity and prosocial behavior, the effects of happiness on voting behavior, big data, and the happiness effects of internet use and addictions. This is a major concern for the lives of adolescents and young adults. The Happiness Report found that those who spend more time on digital media have lower levels of well-being. For example, girls spending five or more hours a day on social media are three times more likely to be depressed than non-users, and heavy internet users (vs. light users) are twice as likely to be unhappy. Sleeping, face-to-face social interaction, and attending religious services—less frequent activities among iGen teens (born after 1995) compared to previous generations—are instead linked to more happiness. Overall, activities related to smartphones and digital media are linked to less happiness, and those not involving technology are linked to more happiness. The report found that digital media activities may also have a direct impact on well-being. This may occur via upward social comparison, in which people feel that their lives are inferior compared to the glamorous “highlight reels” of others’ social media pages; these feelings are linked to depression. Cyberbullying, another direct effect of digital media, is also a significant risk factor for depression. When used during face-to-face social interaction, smartphone use appears to interfere with the enjoyment usually derived from such activities; for example, friends randomly assigned to have their phones available while having dinner at a restaurant enjoyed the activity less than those who did not have their phones available.